We’ll be getting another Live Developer Q&A today with Game Director Ion Hazzikostas. 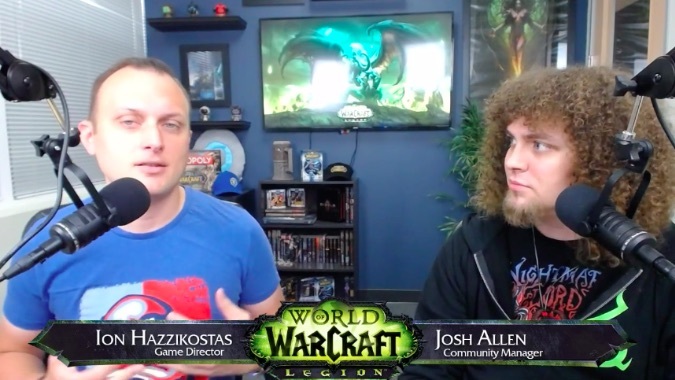 He’ll be discussing a variety of Legion questions including the upcoming raid and patch 7.3.5, as well as questions about the announcements from BlizzCon. Since BlizzCon featured some announcements for patch 7.3.5 it will probably be limited to those specific features. Hopefully we can get some more information about the next expansion, Battle for Azeroth, but that may not come until the alpha or beta launches. Antorus, the Burning Throne is scheduled to release in two weeks on November 28. Patch 7.3.5 doesn’t have a release timeframe yet and it’s not tied with the new raid. We probably won’t expect to see it until after the new year at the earliest. We only know scant information about its features: it will at least include the new level scaling announced at BlizzCon and the Ulduar raid added to Wrath of the Lich King Timewalking. If you’d like to submit any questions, you can post them in the relevant thread or on Twitter using the specific #WoWQA hashtag. They do ask that questions be kept relatively short at 40 words or less so that they can get through as many as possible in the hour that the Q&A is going on. The Q&A will start at 11:00 a.m. PST and will be live on Warcraft’s Twitch channel. We’ll also be re-hosting it on the Blizzard Watch Twitch channel for a more intimate and less chaotic chat experience.